This fascinated me, of course. It’s not new that there are art events in my community since Biskeg Pangasinan hosted a few over the years. What fascinated me are the screenings of local independent films. Being a film-lover, I fought hard for independent films to be screened locally, only to find myself upset or disappointed because the films wouldn’t be given a chance, most of the time. But now CSI’s risking it and is screening four local independent films: “Sunday Beauty Queen”, “Sakaling Hindi Makarating“, “Saving Sally” and “Sleepless”. For most people, it’s just something new. For me, it’s a huge thing! I’ve always dreamt of making Pangasinan people watch local independent films and see more of what Philippine cinema has to offer. This is a great example of stepping outside the box or getting a new perspective. Cinema is such an extremely important art that stimulates experiences, stories, ideas, atmosphere and more. With Pangasinan people getting a chance to watch these features, it will be a great start to gain more perspective when it comes to Philippine cinema. This is a film that I wasn’t able to watch during the Metro Manila Film Festival 2016 because local cinemas in my community didn’t screen it. I watched it yesterday on its first screening and I can’t take my eyes off the screen. The life of an OFW domestic helper was opened up to me almost 17 years ago by the film “Anak” by Rory Quintos, but I gained perspective with “Sunday Beauty Queen”. I am in awe how Baby Ruth Villarama, Chuck Guttierez and others from the team went on to tell the stories of our beautiful Filipina house helpers from Hong Kong. I actually fell in love with our OFWs abroad and cried multiple times on the little, honest sequences. In addition to that, the film opens up a discussion on how we can actually help fight the system in order to save our OFWs from harm. While watching the film, I felt that I was being hugged by these wonderful Queens as I watch their lives unfold. How I wish I could do the same to them. The first documentary film I’ve watched on the big screen was “Documented“ by Jose Antonio Vargas, which opened the 10th Cinemalaya last 2014. From then on, I respected documentary films even more. “Sunday Beauty Queen” is the second I’ve watched and I’m hoping Philippine Cinema will give more documentary films a chance to be screened nationwide. Now, this took me back to my younger years. Besides the total nostalgia and the subtle puns presented by this film, each frame is nothing short of spectacular. I believe it’s the first Filipino independent film of its kind. “Saving Sally” was also made for ten years, mind you, and it didn’t disappoint! The extreme weirdo inside me gained confidence while watching the film. It is a beautiful escape presented in a visual feast of a simple story about young love. Of course, like any other typical love story, monsters lurk within. “Saving Sally” makes you believe in magic and love. Plus, the charming performances swoons you from start to finish. Don’t forget to stay after the credits for a wonderful “The Little Prince” tribute! Once in our lives, we feel the strong need to escape and breathe. This is what Cielo, an agitated and heartbroken artist, did after getting out of a relationship of eleven years. You will fall in love with Cielo as much as you will fall in love with the Philippines while watching this lovely film. The story is not that new but the path it chose is still fresh. I love how honest and mature the story goes. The cinematography and musical score seem like a perfect mixture for Cielo’s journey. A remedy on its own right. Also, the performances are natural and honest, with the quiet moments being as strong as the chatty ones. This is a beautiful soul’s journey to self-love, which is what everyone needs. An honest, beautiful experience is what grounds “Sakaling Hindi Makarating” . Maybe, for everyone, in the future, makarating na. I remember getting on a 6-hour bus trip after a 12-hour shift to catch “Sleepless” in Metro Manila. Technically, I was sleepless while watching “Sleepless”, so imagine how I related to the main characters. What I loved about the film is its silence. Don’t get me wrong, the film has a lot of chatty scenes. But whenever there’s a scene that is silent or even without too much dialogue, it makes the audience observe the character’s movement and reactions, giving us hints of their motivations and intentions. “Sleepless” is set in a bittersweet urban landscape, establishing an intimate atmosphere where the characters usually meet. Also, the wit within its dialogue can be sensed, highlighting subtlety of Gem and Barry’s juxtaposition. B.P. Valenzuela‘s music also emphasised the emotional trail of the story. The emotional honesty of B.P. Valenzuela’s “Early/Late” and “Steady” complemented Gem’s story, supplementing a melody for two people stumbling with each other, finding a sense of relief in the darkest hours of the night. 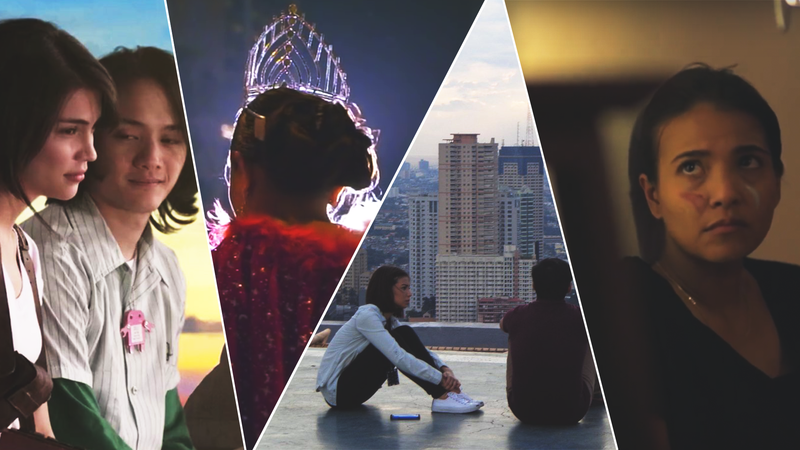 These four films are not new to film festivals locally and internationally, but I still hope that more Filipinos will be able to watch this. There are a lot of Filipino independent films that I would like Pangasinan people to watch, but not all have the luxury of spending bus tickets to go to Metro Manila to catch other Filipino independent films like me. Here’s to hoping more of these films will be screened here in my community. Please take some time to watch these films while they are still screening. Let’s celebrate love together with these four films. I tell you, they won’t disappoint. Plus, you gain more perspective and see the world from the filmmakers’ eyes! Have you watched these films already? Let me know what you think and leave a comment, message, email or anything. Let’s talk about films!